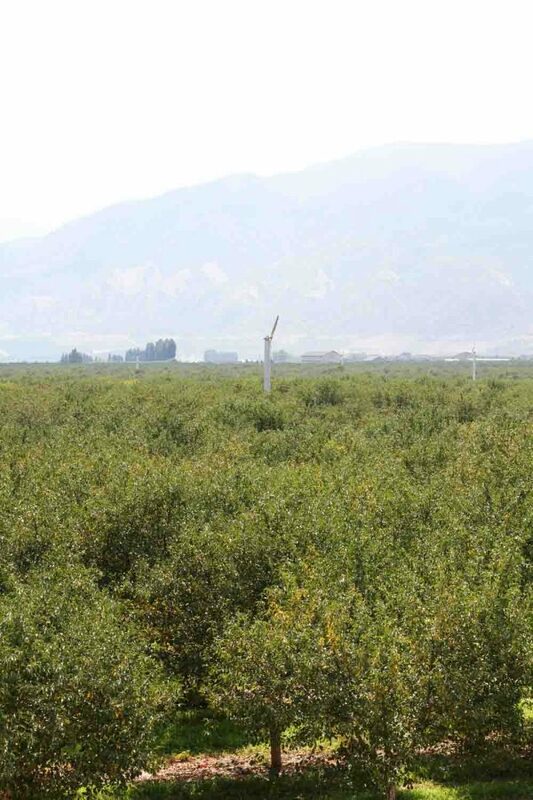 A look at the Tart Cherry Harvest in Santaquin, Utah. 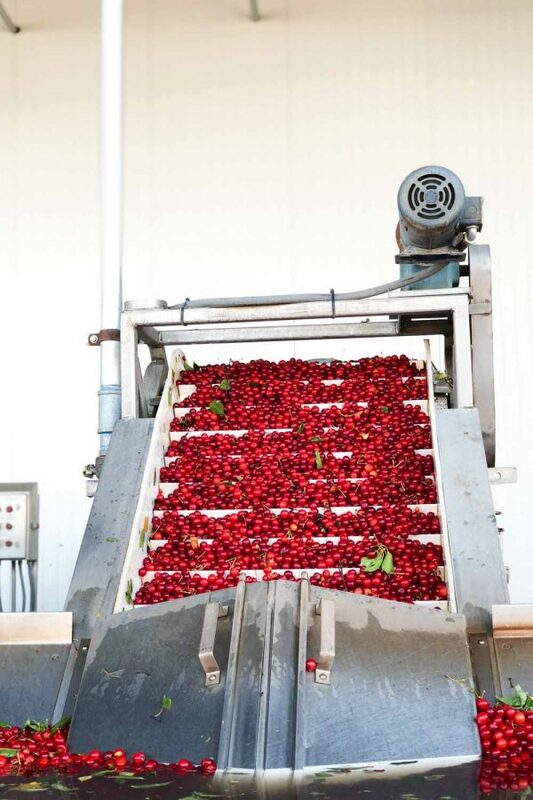 Tart Cherries are used to make tart cherry juice, tart cherry concentrate, dried cherries and cherry pie filing. 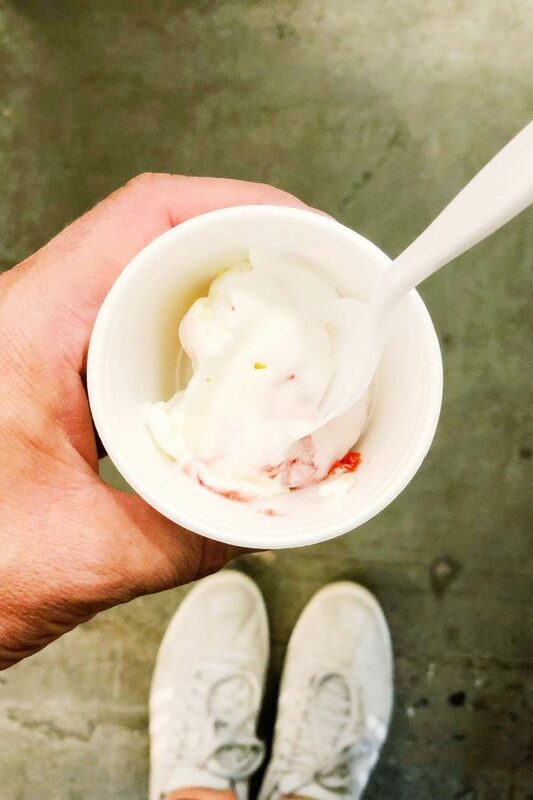 As a lover of food, it should come as no surprise that I actually get really excited about seeing the behind the scenes – where our food comes from, and how it is made. 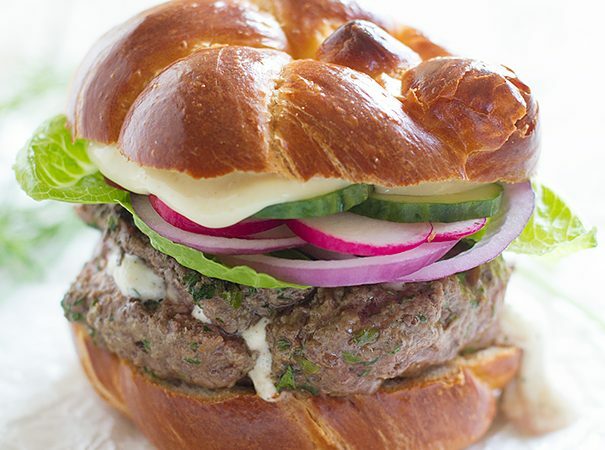 My parents had a huge garden growing up, and we would eat from that garden all summer long. And then my mom would can and preserve much of that garden that we would continue to eat through the remainder of the year. I know a home garden does not compare to a commercial farm, but I think that is where part of my respect comes from. 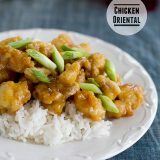 While it’s easy for us to stop by the grocery store on the way home and pick up a few ingredients for dinner, growing, harvesting and preserving that food is not as easy. So it’s always good to get behind the scenes where you can appreciate the devotion and work that goes into bringing that food from farm to table. 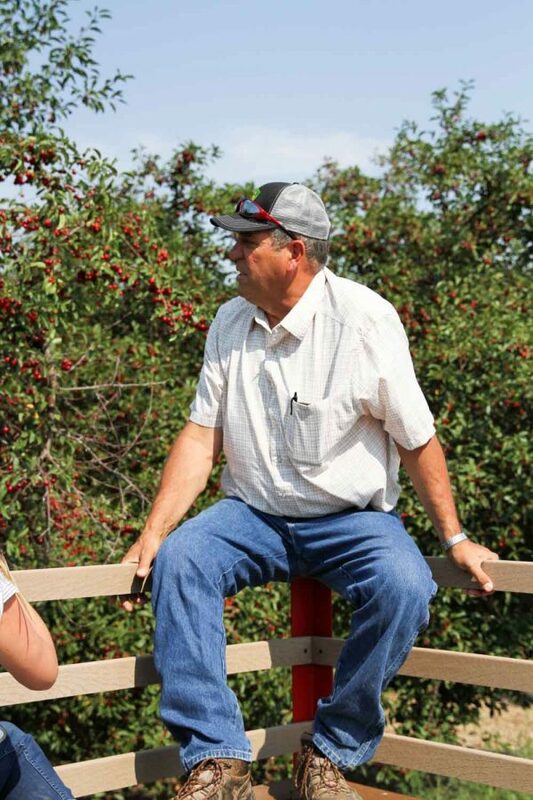 Last week I was invited by the Cherry Marketing Institute to see the tart cherry harvest first hand. 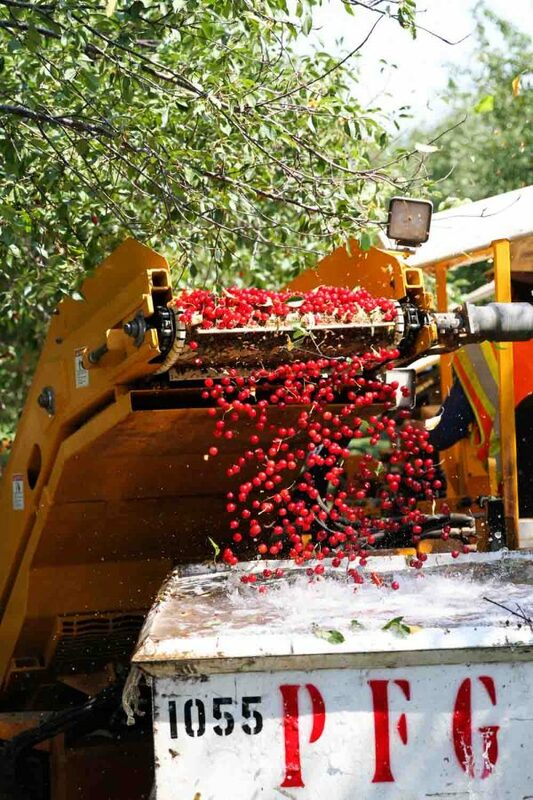 I have lived in Utah for over 20 years now, but am embarrassed to admit that I didn’t know until recently that Utah has the second largest tart cherry crop in the country. 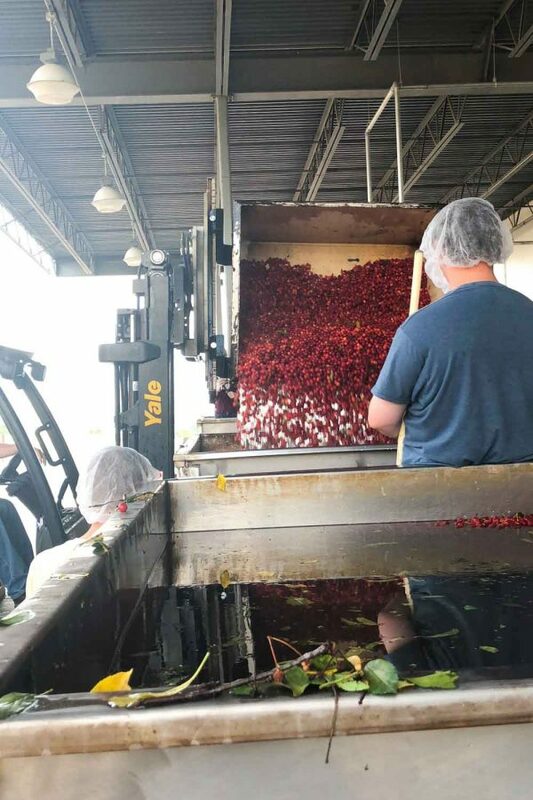 Utah doesn’t produce nearly as many as the number one producer – Michigan – but still produces nearly 30 million pounds of tart cherries each year. 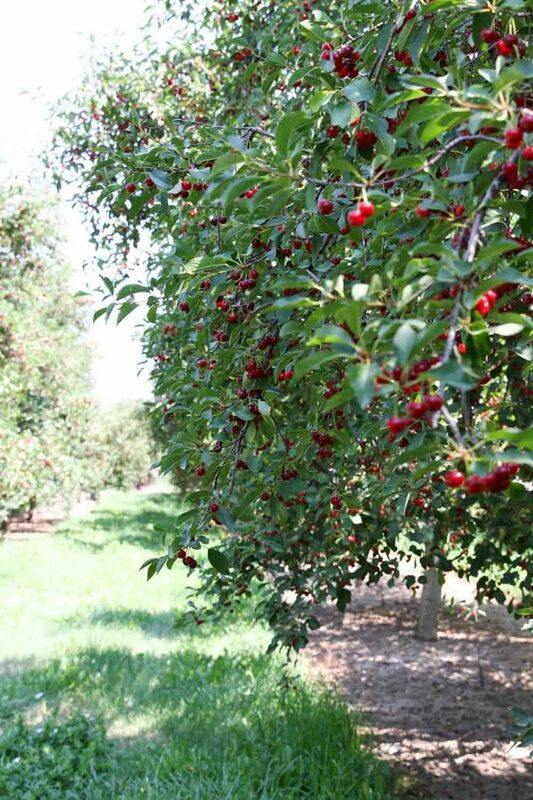 And most of those cherries are grown on farms just south of where I live, on farms in Payson and Santaquin, Utah. 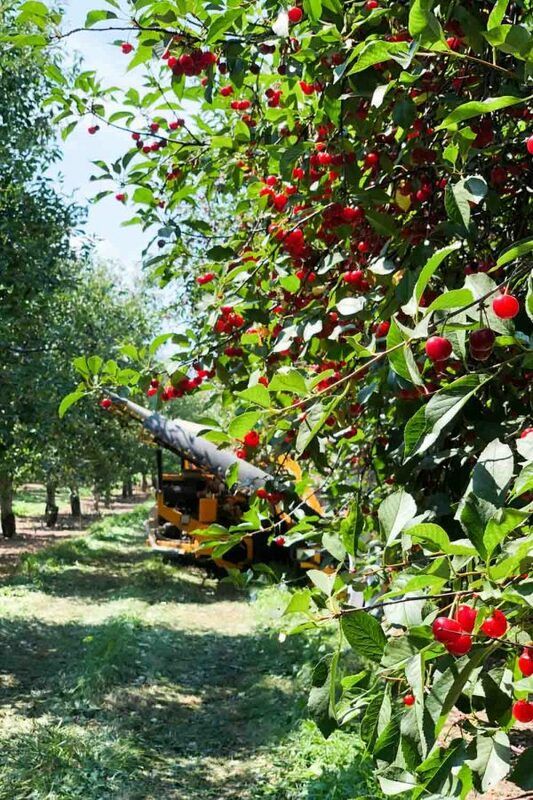 We were taken around the farm by Ray Rowley, of Cherry Hill Farms, where we saw the farm first hand and got to see the cherries being harvested from the trees. There were different aged trees all through the farm. There were new trees (only a year or two old) to trees that will probably be removed soon – some over 30 years old. 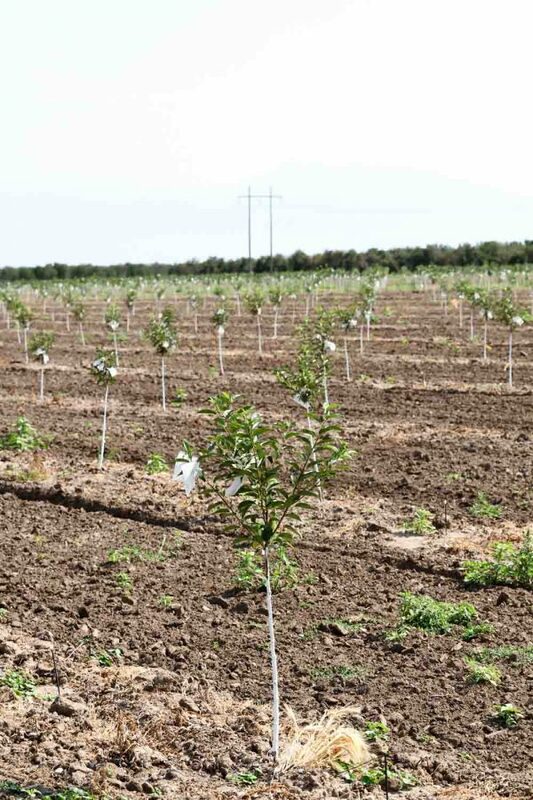 Having different aged trees throughout the farm is necessary, as the new trees won’t even start producing fruit that can be harvested for 6-8 years. 15 years is the prime age for the trees, but some will continue to produce for many years after that. The most interesting part for me, though, was seeing how the cherries are harvested. 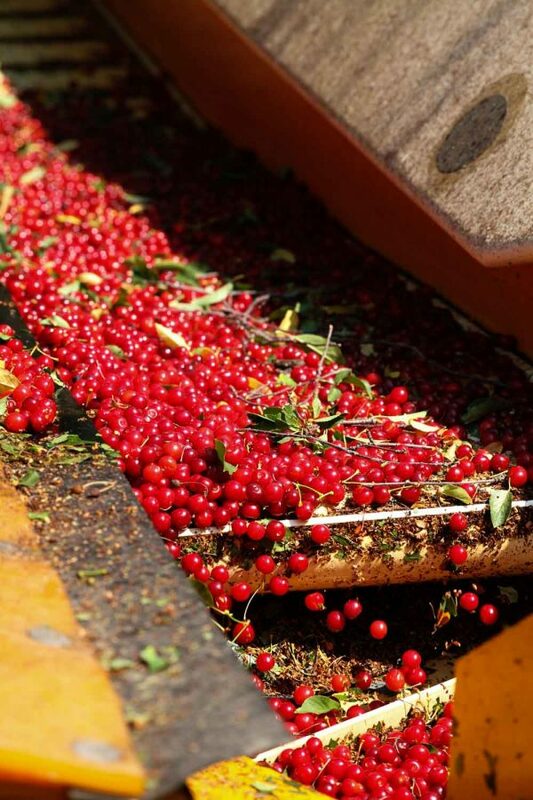 While some of the cherries will be harvested by hand, most of them are harvested with equipment. Two vehicles work together – the first will go right up to the tree. 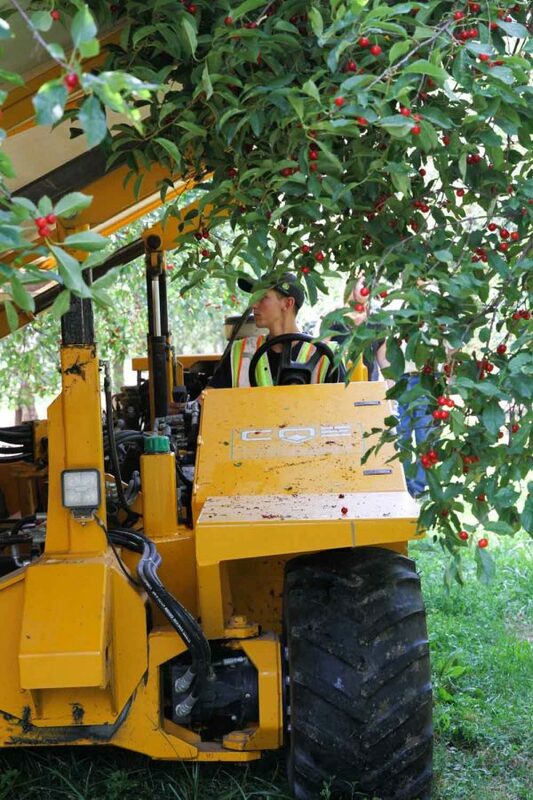 It is a hydraulic tree shaker that gets right around the trunk of the tree and shakes it gently, with just the right amount of vibration to shake all the cherries from the tree. 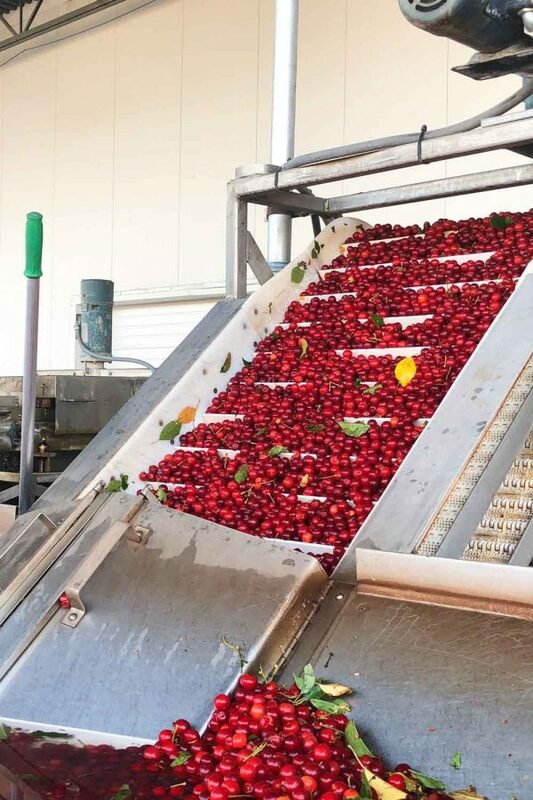 The second vehicle catches the cherries, where they fall onto a conveyor belt that moves them up and over into a large bin of water. 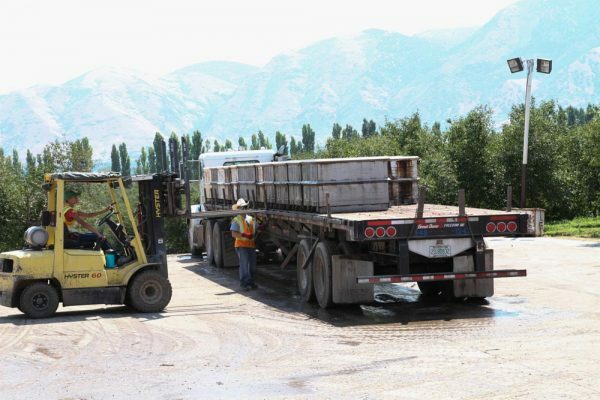 Then the two vehicles move up to the next tree and repeat. 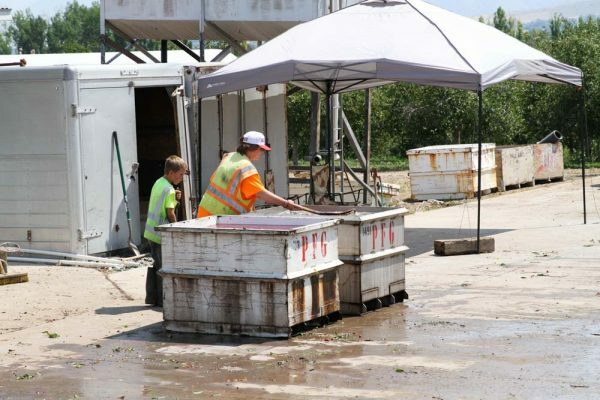 The tart cherry harvest goes on for about 3 weeks every summer, usually mid-July to early August. 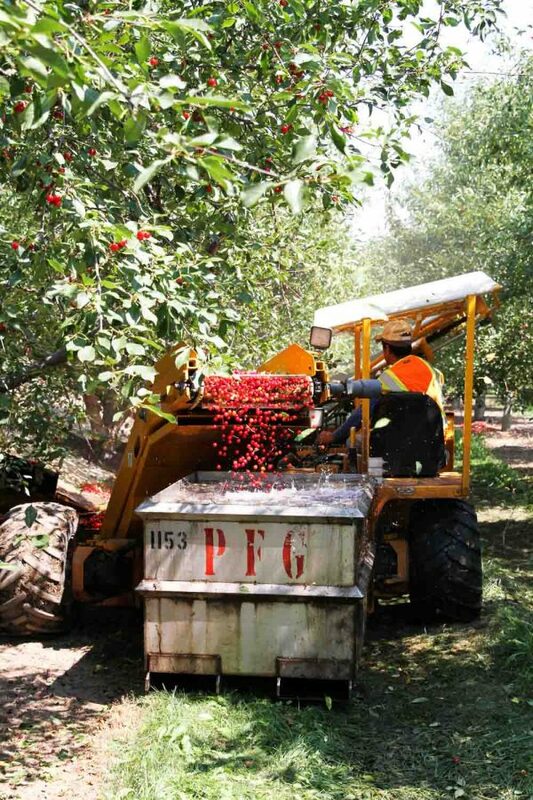 Workers are busy 24 hours a day harvesting the fruit while it is at its peak. 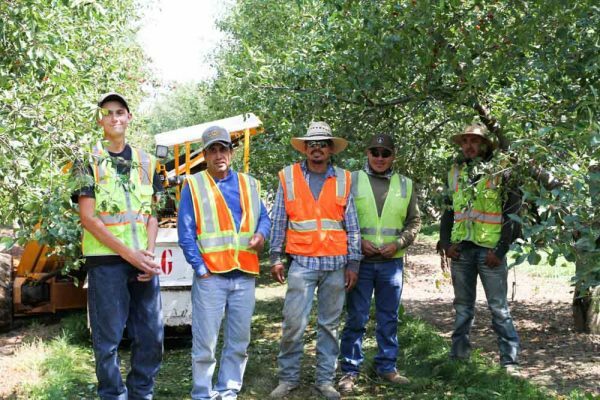 8 different farms in the area come together to form the Payson Fruit Growers co-op. 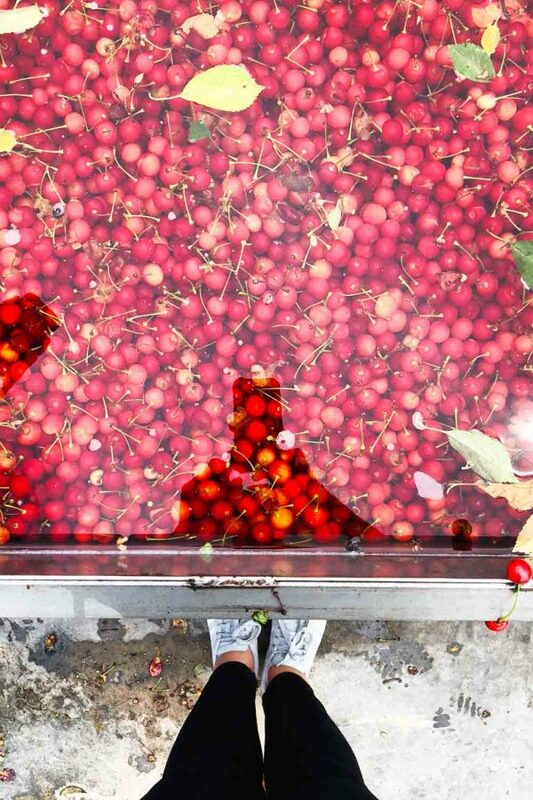 This is where the cherries are taken to be frozen in preparation to be turned into juice, pie filling or dried. 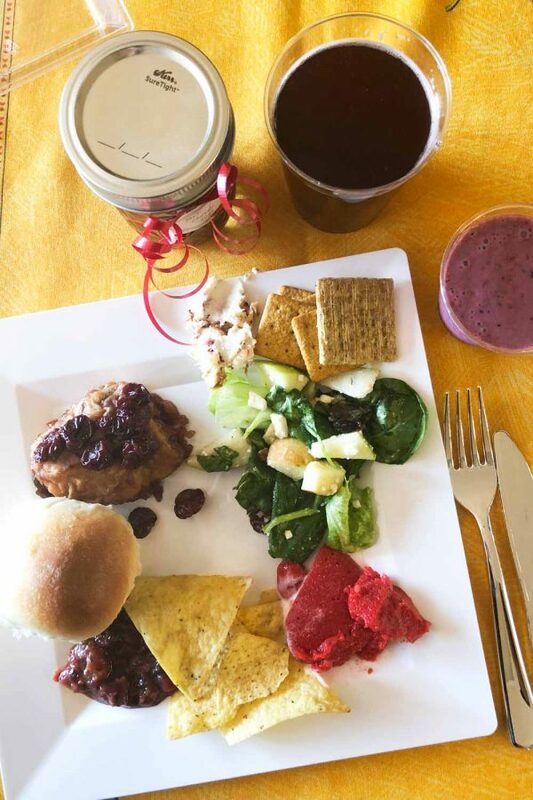 After seeing how the cherries are harvested, we were invited to the home of Karen and Claude Rowley for lunch. Their home had a beautiful view of the orchards below. At their house, we were served a cherry filled lunch by the wives of many of the cherry farmers. It was great to hear from them and how they were connected to the farm. They either grew up in farming families or married into farming families. These families are always so hard working, and I was humbled to be eating this meal that they prepared for us. 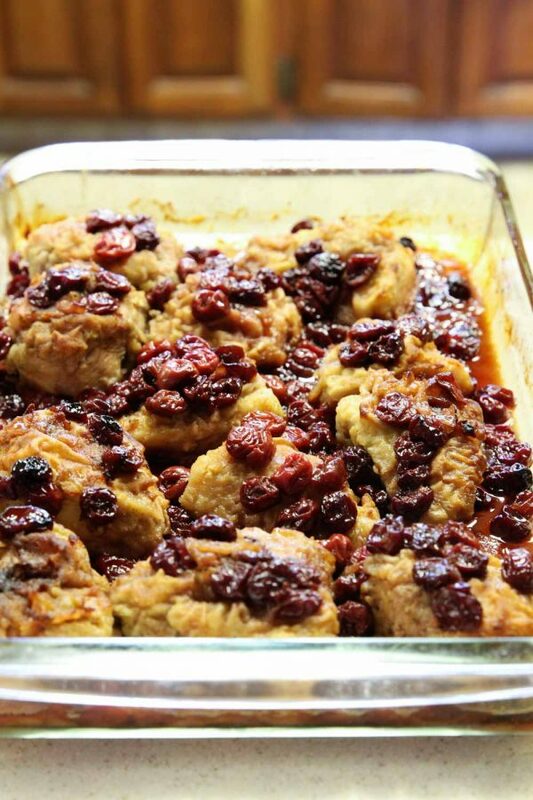 There was Cherry Chicken, a cherry cheeseball, cherry jello, a delicious salad with dried cherries, and my favorite – homemade rolls with tart cherry jam. 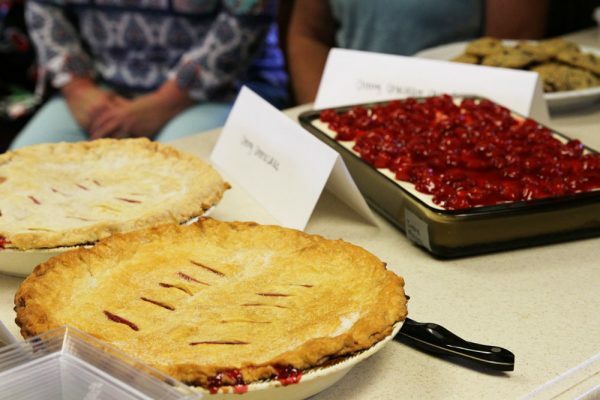 And let’s not forget the dessert – cherry pie, cheesecake, and cookies galore. 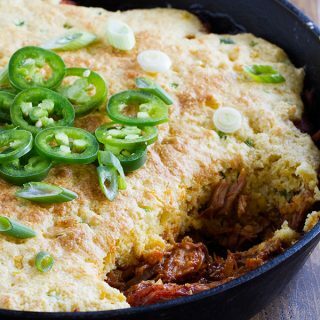 This was farm to table at its finest! 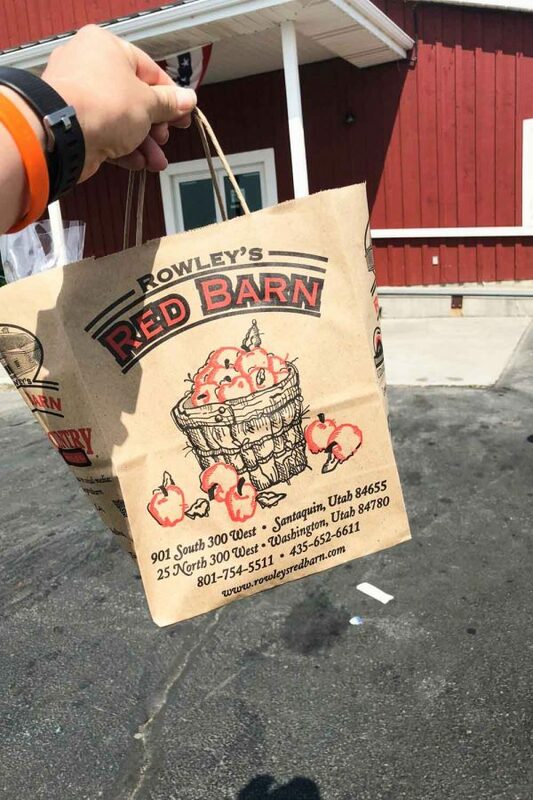 The day ended with a visit to Rowley’s Red Barn (which I will be coming back to!) 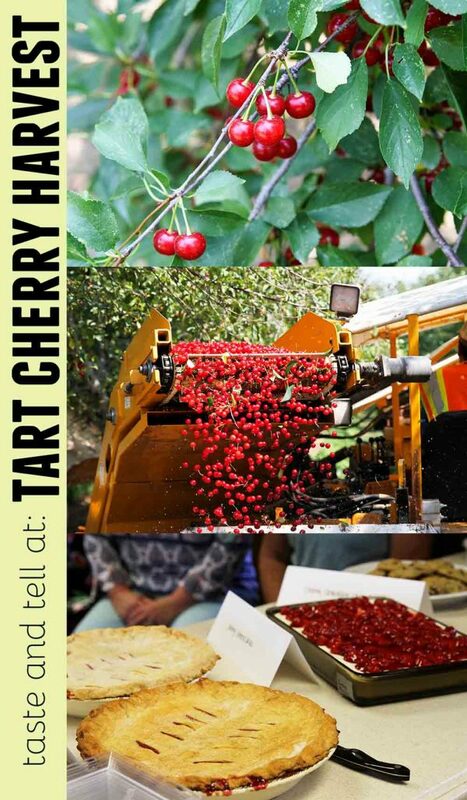 We sampled tart cherries in many different forms. 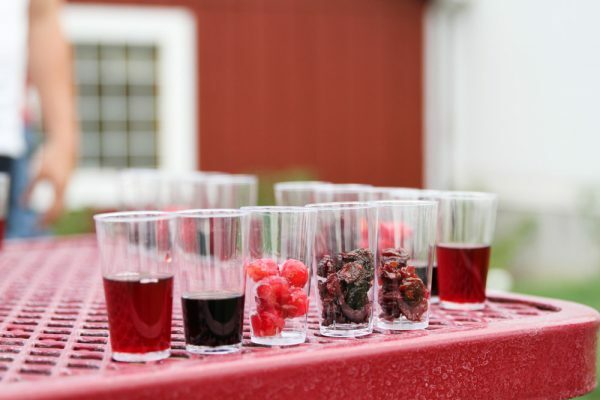 We tasted tart cherry juice, tart cherry concentrate, fresh from frozen tart cherries, dried tart cherries and sweetened dried tart cherries. It was fun to see how different each form tasted. But it was also fun to also learn the many ways you can use these cherries. We of course had to sample a new ice cream flavor (cheesecake ice cream with cherries and pie crust!) I also had to pick up some of the cherry salsa we had at lunch. I am not a nutritionist, so I won’t get into depth about the health benefits of tart cherries. 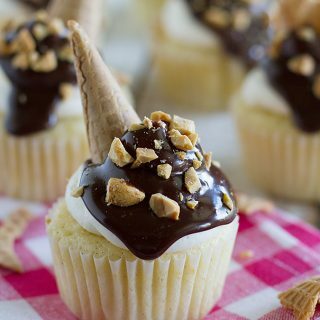 But I actually did some research on them back when I wrote my smoothie cookbook. 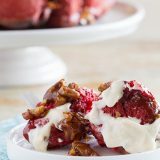 In the book, I have a chapter on bedtime smoothies, and in that chapter, I talk about tart cherry juice because tart cherries contain melatonin which aids in sleep. 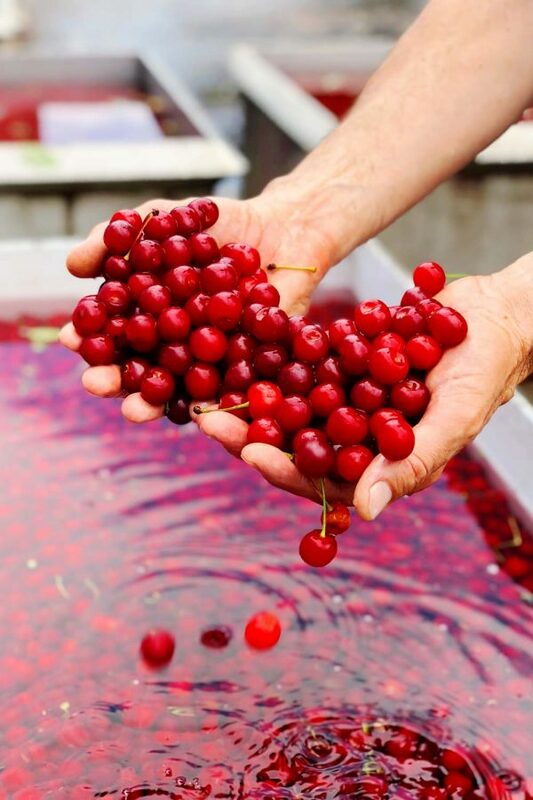 Tart cherries are known for much more today. 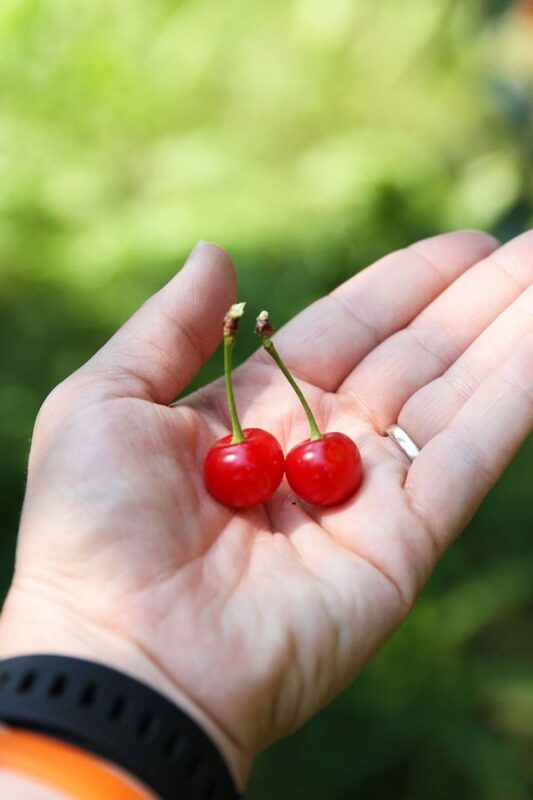 In fact, the cherries are now being called a superfruit because of all of their health benefits. The cherries are nutrient dense (a good source of vitamin c, vitamin a, and copper). 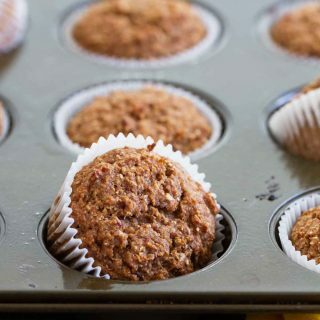 They aid with exercise recovery. 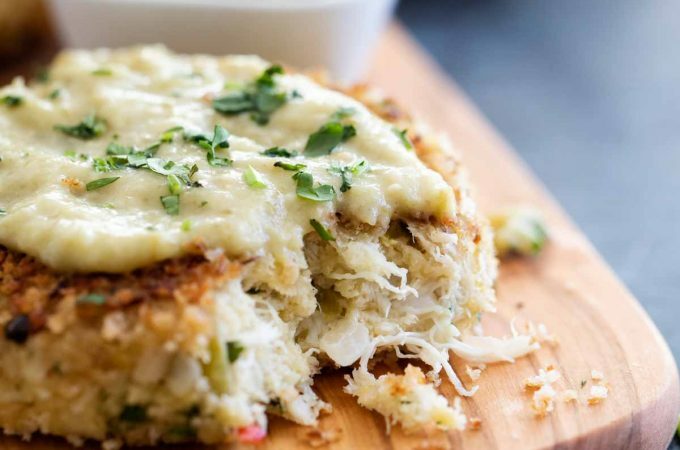 They are heart healthy, helping with blood pressure and blood lipids. 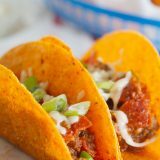 There are also studies that show that they help with arthritis and gout. 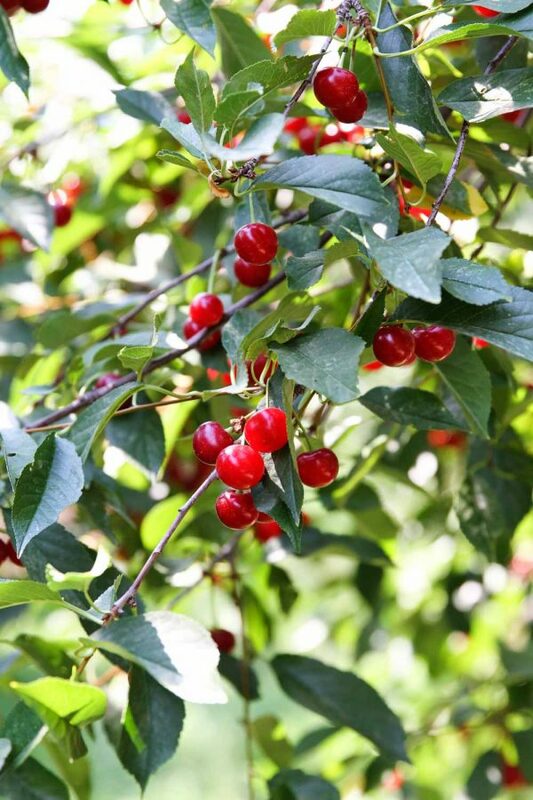 I do also want to mention that when you are looking for tart cherry products, look for the Montmorency cherry variety. 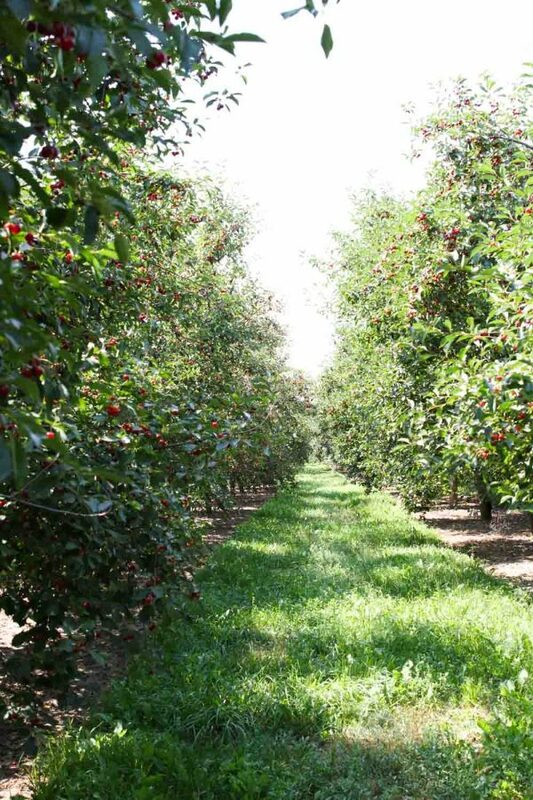 Montmorency cherries are the variety that are grown here in the United States. 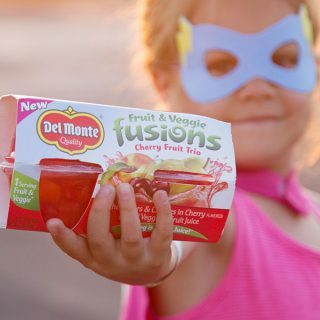 Many cherries are now being imported from other countries, but by looking for the Montmorency variety, you know that you are supporting American family farms. And after spending that day with the farmers and their families, I am once again reminded how important these American family farms are.